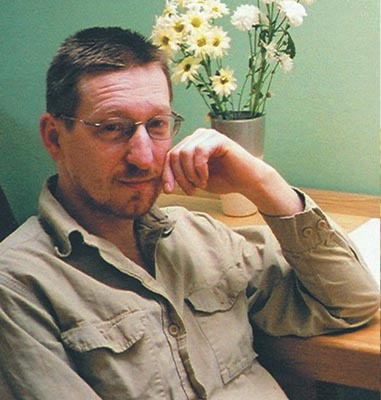 I wrote to Rimas in the spring of 1999, and he subsequently attended one of our South East London and Kent regional meetings of the BWA, together with his wife, Ilona, whom he met whilst studying at Art College in their native Lithuania, some 26 years ago. 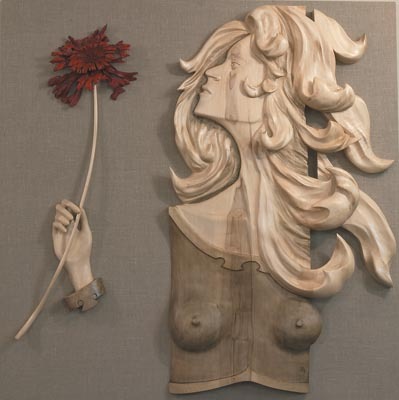 They brought some of their work to the meeting and everyone was amazed at the quality of the finely detailed, delicate work; Ilona, as well as being an artist, is an accomplished woodcarver. They, together with their two daughters. Rita and Emily, are an exceptional and very talented family. It was a sad loss for me and the group when they left England. In the eight years he spent in the UK, Rimas worked on many prestigious projects, buildings and sites in his capacity of joiner, focusing on varied and complex work, including wreathed handrailings. 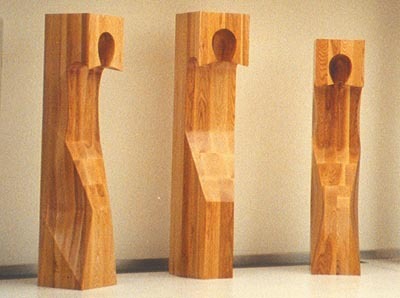 He also took on woodcarving commissions such as the 2.5m high free-form figures Siluetai (Silhouettes), situated in the foyer of a new wing extension at Acton Hospital, opened by the then Prime Minister, Tony Blair, and a similar styled work at Barnet Hospital entitled Saitai, along with many other pieces. 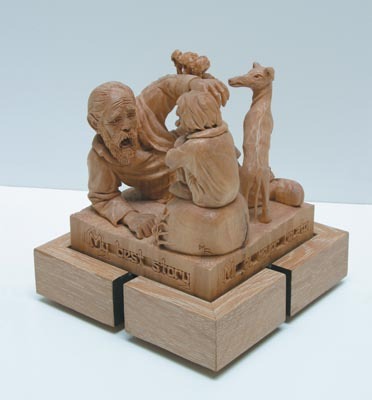 Woodcarving magazine (issue 59, page 39) ran a feature on The Woodentops' Bromley Library Exhibition, which included Rimas' carving of My Best Story, along with the work of other members. The piece was originally intended for the BWA Cube Competition, but he ran out of time. Rimas was an active group member and participated in many of our events, including master classes, various shows and a charity event, which saw him carving a mask in less than an hour for £10 towards charity; there were no preliminary drawings, just co-ordination, a steady hand and a cool head. 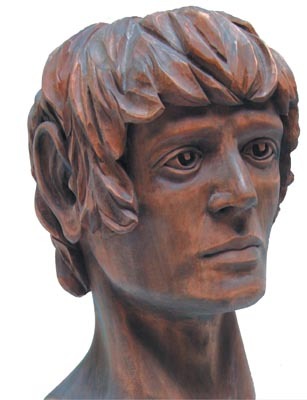 He is a brilliantly, versatile artist in the true sense of how I have always thought artists and art should be, and not in the styles reflected in the Turner Prize collections, and the like; perhaps I should not comment on this form of art as I have not studied it, but I know what I like and for me wood art is good art. I am probably biased, having been a 'wood butcher' all my life, with sawdust for brains and sap in my veins! 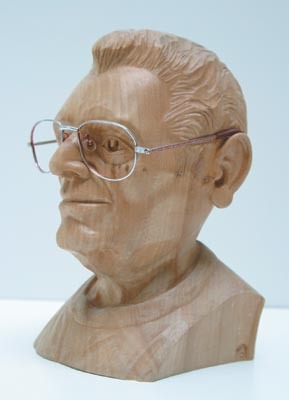 Rimas, however, seems to have the capacity to appreciate everyone's efforts and works, and I have never heard him criticise any work; not only is he a great carver but a great guy with a good eye! At Rimas' invitation, I visited The Parliament Building in Lithuania, on the 13 June 2006, which was attended by members of the British and Lithuanian embassies, along with representatives from a range of industries. On show were some of Rimas' latest pieces: Raudonieji Kerai (Red Magic); Mokyojas (Master) in bronze; and the Christ Figure, framed. Also at the event were the many pieces I have seen and admired previously in the UK. Ilona ends Rimas' CV with the words, "He still has a lot to say". I say he is a very sincere man who does not say a lot but his work speaks, and God willing, will continue to speak volumes! There is no need to translate the language of art; it is universal and shared by all; that is the supremacy of art. 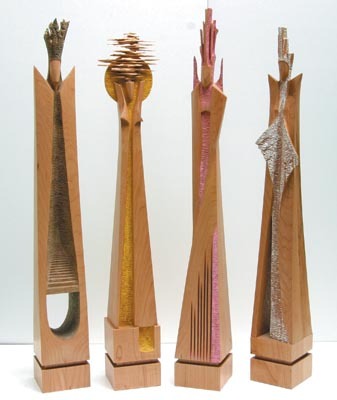 Rimas Metlovas produces extraordinary pieces that are unusual for Lithuanian wooden sculpture. Wood is an intricate material to work with; it does not forgive mistakes, but the warmth spread by a finished piece breathes life, compensating for the difficulties encountered during the creation process. 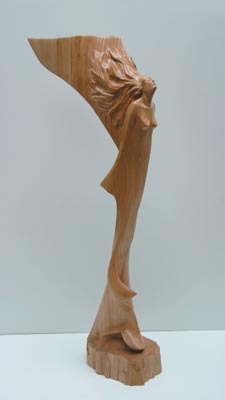 Rimas’ sculptures are identified by its elasticity, perfect curves and elegant lines, and he achieves the same results in traditional and modern sculpture. Whilst distancing himself from the teachings of art teachers and sculptors, Rimas found his own style by using unconventional techniques, restlessly experimenting with different materials that reveal artistic depth and free spirit. 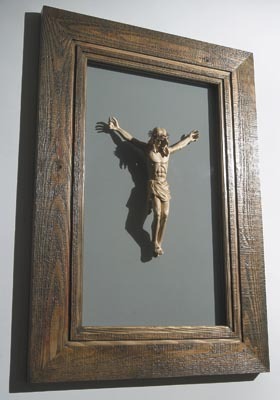 An increasingly popular, hard-line, modern art is foreign to him – he is inspired by openhearted Lithuanian sculpture, crosses and roadside shrines. Currently he is living and working in the city of Kaunas, even though his artistic route spreads well beyond Lithuania. His major, large scale projects include a composition of sculptures entitled Silhouettes, commissioned for the newly built ACAD centre in London in 1999, and the impressive Connection, created as a centrepiece for the Barnet Hospital. His life like works such as My Best Story and Woman and Bird won top prizes at prestigious Wembley and Midlands exhibitions in Great Britain.